The ancient catacombs of St. Domitilla sprawl for more than 10 miles (17 kilometers) in a labyrinth of tunnels beneath Rome and contain numerous tombs, many belonging to the city’s elite. Now, using a technique called laser cleaning, in which lasers are used to remove centuries of grime, researchers have uncovered elaborate frescoes in two sections of the catacombs: the burial chamber used by a grain purchaser (sometimes referred to in scholarly literature as a baker) and the “introductio,” which shows a “a personal presentation of the dead to Christ,” said Barbara Mazzei, an archaeologist with the Pontifical Commission for Sacred Archaeology, the organization that unveiled the newly visible frescoes at the end of May. The chambers were first discovered about 400 years ago by an explorer named Antonio Bosio. An image of Christ seated on a throne surrounded by his apostles can be seen in a burial chamber in the catacombs of St. Domitilla in Italy. “Only the wealthiest families could afford a burial chamber,” Mazzei told Live Science in an email. 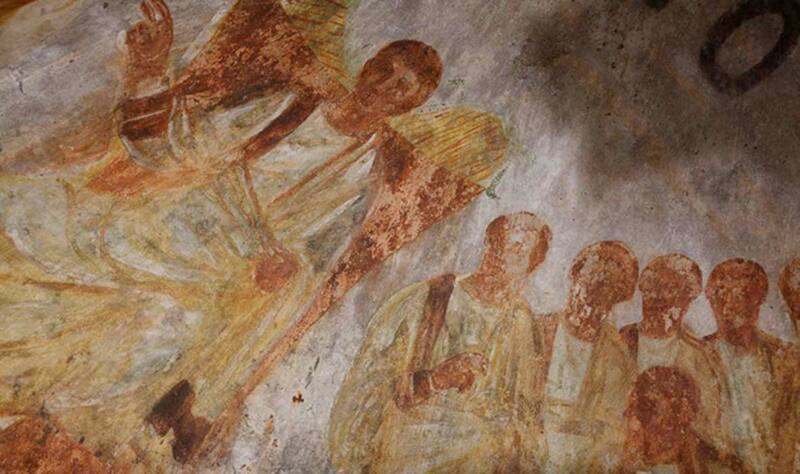 The catacombs date back about 1,600 years and are considered to be among the oldest Christian cemeteries. Once the lasers had delicately chipped away soot and other particles that had built up over the years, a 1,600-year-old fresco showing a grain purchaser, was revealed in greater detail. Previously, researchers knew of the individual and sometimes referred to him as a “baker,” but the laser cleaning of the painting allowed details of the purchaser, as well as frescoes in the tomb showing Rome’s grain trade, to be seen in greater detail. The grain purchaser (who was buried in this particular chamber) is “dressed in a richly decorated tunic and located behind a large modius,” which is a container used to measure and distribute grain, Mazzei said. The walls near the image of the grain purchaser show details of the activities of the Annona, an office that handled the purchase and distribution of Rome’s grain supply. The grain purchaser was probably someone of “high rank and relevance at the top of the Annona office,” Mazzei said. The grain purchaser appears to be “very proud of his work and of the social level he gained,” Mazzei said. A bucolic scene with a shepherd and another with Christ on a throne between two groups of apostles were also revealed in the catacombs. “The other scenes are drawn from the Old and New Testament,” Mazzei said. Mazzei said there are many more frescoes that need to be cleaned in the area near the grain purchaser’s tomb and in other parts of the sprawling ancient catacombs beneath Rome.